This course teaches you how to create detail and summary tabular reports using Base SAS procedures. You also learn how to enhance your reports using the Output Delivery System (ODS). The self-study version of this course contains structured course notes that provide a detailed overview and exercises that help you develop essential skills. There is also a Virtual Lab that enables you to practice what you learn in the course. 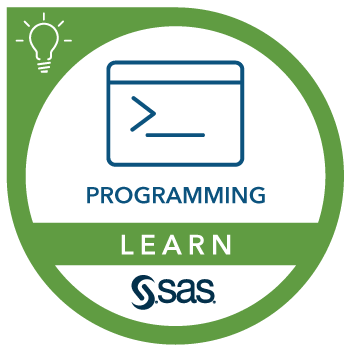 This course can help prepare you for the following certification exam(s): SAS Certified Clinical Trials Programmer Using SAS 9. Enhance PROC PRINT detail tabular reports. Create PROC TABULATE summary tabular reports. Create PROC REPORT detail and summary tabular reports. Send report output to third-party and SAS ODS destinations. Enhance reports using ODS options and statements. ODS with the SAS interfaces. Creating reports with the PRINT procedure. Introduction to the TABULATE procedure. Creating the structure of the table. Enhancing with labels and formats. Introduction to the REPORT procedure. Creating a summary report with the GROUP usage. Creating a summary report with the ACROSS usage. Adding trafficlighting and style attributes. Using the CALL DEFINE statement. Using ODS options and statements. Controlling bookmarks and the table of contents.